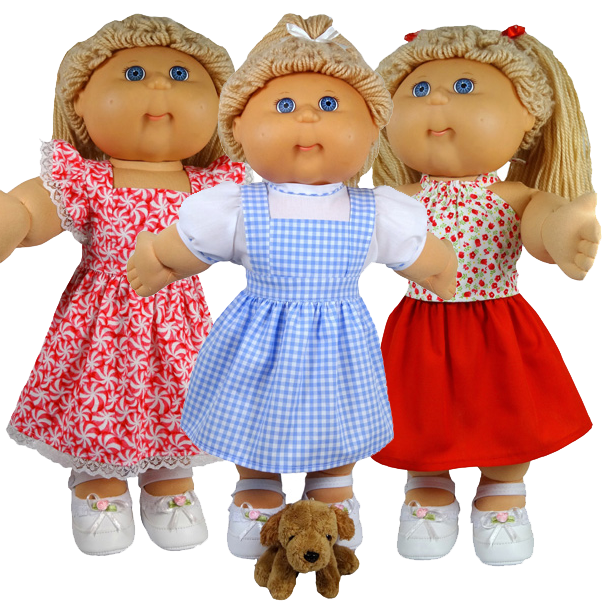 Well Cabbage Patch Kids doll clothes pattern customers, it’s finally here – my Pinafore, Dress and Skirt doll clothes pattern for the 18 ½ inch Cabbage Patch Kids doll. This is such a versatile pattern as you can make three totally different outfits. Firstly, you can make the sweet Pinafore Dress with sleeves and whether you make it with lace on the sleeves and hem or without, it’s absolutely gorgeous and perfect for our hot summers. Then you can make the pattern without sleeves and it becomes a pinafore or apron just like Dorothy wore in ‘The Wizard of Oz’. Or if you want a skirt that can be mixed and matched with lots of little tops, then you can make that too. It’s a super easy pattern to make and of course comes with LIFETIME access to my step-by-step video instructions which make it even more fun to sew.